It wasn't so long ago that "iced coffee" meant dumping day-old coffee over a cup of ice. Luckily, times have changed: People became more conscientious and particular about their coffee, and purveyors like Portland's Stumptown and Oakland's Blue Bottle introduced cold brew, a new breed of coffee specifically brewed to drink chilled. It quickly became the darling of the coffee world, suddenly ubiquitous in respectable coffee shops across the country. A few years later, it had firmly entered mainstream consciousness -- you could find it on the menu at chains like Starbucks and Dunkin' Donuts. But for as popular as cold-brew coffee has become, the prevailing opinion among coffee professionals, and the industry's worst-kept secret, is that it is utterly trash. What they know that you don't: Flash-chilled iced coffee is so, so much better. 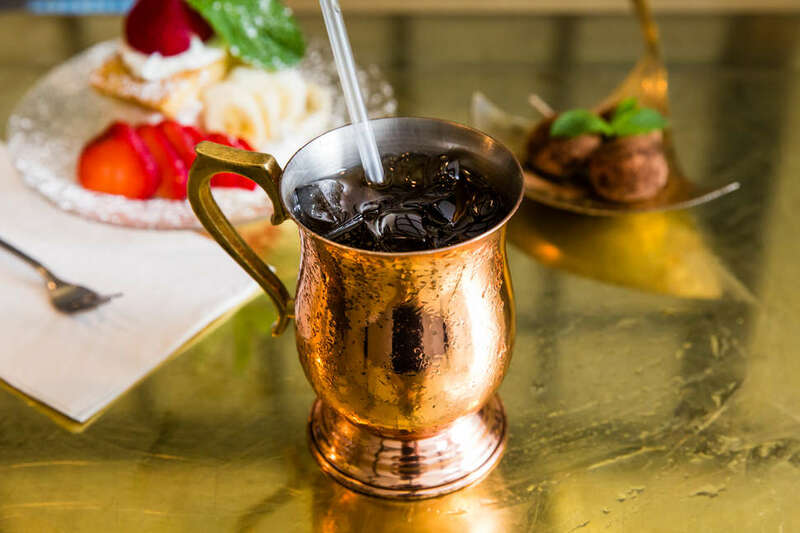 Also known as Japanese iced coffee (pronounced aisu kōhī), flash-chilled coffee mimics the pour-over method for hot coffee, but does so directly over ice, whether via a Chemex, into a single-serving cup, or using a larger vessel for a bigger batch, as many coffee shops do. (In Japan's enviable 7-Elevens, you're handed a cup filled with ice to take to the machine that dispenses hot coffee.) Though Japan's specialty coffee shops had been serving much of its cold coffee flash-chilled already, the method didn't make it to the States until Peter Giuliano, then the director of coffee for Counter Culture and iced-coffee detractor, visited Japan in 1994. After being initially exposed to the method, Guiliano sought out specialty coffee master Hidetaka Hayashi for mentorship, and proselytized for the method upon his return. And despite Guiliano having his fair share of disciples today, flash-chilling has remained mostly an under-the-radar technique. Flash-chilled coffee often addles people on the first sip because it tastes so similar to tea. The flavor is bright and complex, floral but not perfumy, fruity without being cloying. The result is a significantly more delicate and light-bodied product. Specific profiles of coffee beans are isolated, and differences in roasts are especially noticeable, even if beans come from the same region or country. And adding milk or a sweetener would only cloud and overwhelm the delicate drink. The subtle and smooth result of the flash-chilled method is why many coffee experts prefer it over cold brew. "Everyone who actually takes coffee seriously in what we call the 'Third Wave coffee movement' thinks [cold brew is] garbage," said Jeremy Tooker, the owner of Four Barrel Coffee in San Francisco, referencing the faction of coffee shops and roasteries that treat sourcing as sacrosanct, and evangelize the merits of single-origin beans. Featureless, harsh, "something of an abomination" are common descriptors you'll hear about the drink from baristas. Yuki Izumi, who runs the coffee program at Hi-Collar in New York City, said that cold brew is just "flat." The "battery-acid" flavor is due to cold brewing's imprecise process that can take anywhere from overnight to an entire day, and the ratio of coffee to water can fluctuate without consequence. "You’re like, 'Five pounds-ish [of coffee grounds], to, whatever, five gallons of water, for I don't know, 12 hours,'" said Tooker. Forgot to strain the grounds from the water? Oops, but steeping for 24 hours is also fine. "All the rules go out the window. It’s obviously a compromise." Flash-chilled coffee, on the other hand, tastes much fresher. "It brings out the character of the beans," said Izumi. When you flash-chill, the aromatics of the hot coffee don't have a chance to escape. The moment the scalding liquid hits the ice, it locks in particular olfactory notes and drastically reduces the chance of oxidation, which turns coffee rancid. Think of it like blanching vegetables. The entire process literally takes just two or three minutes -- a fraction of the time cold brewing takes -- and it's super-easy to do at home. At Four Barrel, Tooker and his team have developed a sophisticated, proprietary method that -- in an oxygen-free ecosystem -- brews coffee at 200 degrees, and in three seconds hurdles the temperature down to a precise 35 degrees. "You can get the body [of cold brew] out of our method, but retain the nuances and characteristics of the coffee," said Tooker, who is opening a facility in Brooklyn specifically to focus on developing more of this style of cold coffee for Four Barrel to eventually distribute. "There was a gap in the market for this particular product." While it's true that there is a noticeable lack of coffee companies commercially selling shelf-stable, flash-chilled coffee, plenty of smaller cafes across the country have been quietly peddling their superior wares. Rohs Street Cafe in Cincinnati has made cold coffee this way since at least 2014; Coffee Bar and Slipstream in Washington, DC, are in the game as well. 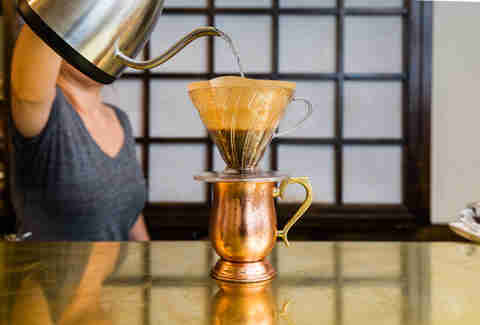 Along with Hi-Collar in New York where you'll pick from a curated list of beans to brew at the bar, Gimme! Coffee is offering flash-chilled coffee along with their cold brew, making the hard sell to try the former option over the latter at the register. It doesn't take much to recognize the difference, said Tooker. "You just have to taste it side by side -- it’s like night and day." Leanne Butkovic is a features editor at Thrillist. Follow her on Twitter @leanbutk.